I was invited by Mariuca to join her on a BEARY-special meme and here I am, wholeheartedly welcoming BEAR-iuca into my home! Bring me lots of luck baby! Will you..? I am passing on The Spirit of BEAR-iuca good luck charm to everyone who is reading this! Please play along with us by taking part in this meme. 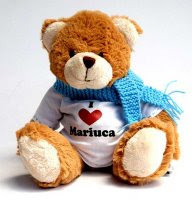 Don't you want to welcome BEAR-iuca into your home? 1. Mariuca 2. Roxiticus Desperate Housewives 3. Mariuca’s Perfume Gallery 4. Roxy’s Best Of... 5. Bay Head Blog 6. Roxiticus Best Blogs 7. Emila's Illustrated Blog 8. Metz - Empty Streets 9. The Spirit of Blogging 10. Speedcat Hollydale Page 11. Snapshot 12. purplefrogcat 13. Turn-u-Off 14. YOU Next! Hola Monica! Thank you bear-y much for welcoming BEAR-iuca into your lovely home. We hope he will bring lotsa luck and love into your home! Yeaqhhhhhh I am finally fixed with my satellite. Just dropping in to say hi! Wow you guys are exactly 26 hours ahead of me in time. I need to get this done on my blog too. But, I have 2 more days of photo memes running! I'm getting better, but I had a busy weekend as usual..hehe! hi sweetie, you're still busy with your work, huh?